Cameron County is a county located in the U.S. state of Pennsylvania. As of the 2010 census, the population was 5,085, making it Pennsylvania's least populous county. Its county seat is Emporium. 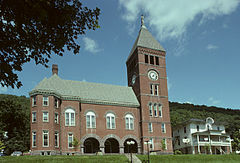 The county was created on March 29, 1860, from parts of Clinton, Elk, McKean, and Potter Counties. It is named for Senator Simon Cameron. According to the U.S. Census Bureau, the county has a total area of 398 square miles (1,030 km2), of which 396 square miles (1,030 km2) is land and 2.2 square miles (5.7 km2) (0.5%) is water. As of the 2000 census, there were 5,974 people, 2,465 households, and 1,624 families residing in the county. The population density was 15 people per square mile (6/km²). There were 4,592 housing units at an average density of 12 per square mile (4/km²). The racial makeup of the county was 98.83% White, 0.35% Black or African American, 0.13% Native American, 0.12% Asian, 0.05% Pacific Islander, 0.05% from other races, and 0.47% from two or more races. 0.57% of the population were Hispanic or Latino of any race. 26.5% were of German, 13.5% American, 13.3% Italian, 10.9% Irish, 8.2% English and 5.8% Polish ancestry. There were 2,465 households, out of which 27.70% had children under the age of 18 living with them, 52.40% were married couples living together, 9.20% had a female householder with no husband present, and 34.10% were non-families. 30.10% of all households were made up of individuals and 15.40% had someone living alone who was 65 years of age or older. The average household size was 2.39 and the average family size was 2.96. In the county, the population was spread out, with 24.50% under the age of 18, 6.00% from 18 to 24, 24.90% from 25 to 44, 24.80% from 45 to 64, and 19.80% who were 65 years of age or older. The median age was 41 years. For every 100 females there were 96.60 males. For every 100 females age 18 and over, there were 94.60 males. There are three Pennsylvania state parks that are partly in Cameron County. Bucktail State Park Natural Area is a 75-mile (121-km) scenic route along Pennsylvania Route 120 stretching from Lock Haven in Clinton County to Emporium the county seat of Cameron County. both of these state parks straddle the Cameron and Potter County line. The West Creek Rail Trail has been built on the abandoned rail corridor between Emporium and St. Mary's in Elk County. It provides a paved surface with guard rails and is suitable for hiking or biking in the warm seasons or snowmobiling in winter. The Fred Woods Trail offers a 4.57 mile loop of blazed trail with scenic valley views and a challenging section running through unique rock formations. The trailhead is accessed off Mason Hill Road above Driftwood, PA.
Map of Cameron County, Pennsylvania with Municipal Labels showing Boroughs (red) and Townships (white). The population ranking of the following table is based on the 2010 census of Cameron County. ^ "Population and Housing Unit Estimates". Retrieved October 6, 2018. ^ "Fred Woods Trail". VisitPA - #visitPA. Retrieved 21 November 2018. ^ "Fred Woods Trail Description". www.wapitiwoods.com. Retrieved 21 November 2018. Wikimedia Commons has media related to Cameron County, Pennsylvania. Pennsylvania Department of Transportation, Bureau of Planning and Research, Geographic Information Division, "2005 General Highway Map of Cameron Countiy". [permanent dead link] Note: shows boroughs, townships, roads, villages, some streams. URL accessed on April 6, 2006.